A refreshing, delightful Pinot Gris. This wine is “spicy apple and pear pie in a bottle”. Fermented in steel; then aged in neutral oak to soften the acids and produce a creamy finish. FedEx Ground (availbility dependent on temperature) $30 to $60 per case. FedEx 2 Day Air $60 to $102 per case. Offer not valid in states/countries that do not allow the direct shipments of wine. Shipping may vary according to region. Shipping & Handling costs will be provided and payment arranged by seperate email following submission of order. Will someone over 21 be available to accept the order? 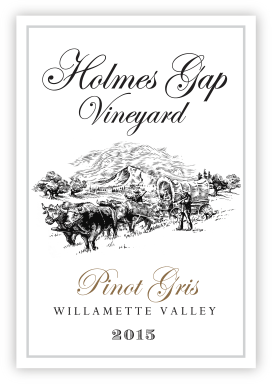 Holmes Gap, established in 2004 by Jack & Cheri La Rue, was planted in the Spring of 2006, was designed specifically to give the plants adequate time to generate a root system — producing the highest quality grapes desired. As the vineyards mature, we provide less and less irrigation, watering only on a “regulated deficit irrigation” (RDI) basis. The RDI technique can be used to accelerate ripening and improve fruit flavors in a cool climate such as ours. All of the Holmes Gap Vineyard blocks are planted on southeast facing, sloped hills, ranging from 200 to 450 feet in elevation. Upper Block: The Upper Block, ranging up to 300’ elevation, is planted to Pommard Pinot Noir on 3309C rootstock. The Pommard clone of Pinot Noir was one of the first clones grown in Oregon. It is considered as a backbone of Oregon Pinot Noir. It has characteristic aromas of blue/black fruits, Marionberries, spice, earth and stone fruits such as plums. It is known for its good color, great structure in both width and length. This block is comprised mainly of Helvetia silt loam soils with areas of Chehulpum. Lower Block: The Lower Block, ranging from 270’ to 200’ elevation, is also planted to Pommard Pinot Noir on 3309C. 3309C is one of the preferred rootstocks	for growing premium wine grapes and accounts for 45% of the rootstock used here. It is resistant to the diseases commonly found in older Oregon vineyards, has a good capacity for developing a strong, deep root structure, and is a low-vigor rootstock. The soils in this block are mainly Woodburn silt loam soils, with Chehulpum at the top of the block and some Helvetia in the lower portion. The Lower Block has the highest organic matter and therefore contains some of our most fertile soil. Vigor management differs greatly from its neighboring Upper Block. Charity Block: This 1.7 acre plot was planted to Pinot Gris (152 on 101-14MG rootstock). Soil type is mainly Helvetia silt loam. These soils with a depth up to 72” are moderately well drained with a high water holding capacity. Block Four: This newly developed block, planted in 2015, contains both Pinot Noir and Chardonnay sections. The Pinot Noir Dijon clone 777 was selected for planting on the higher elevation of the block (up to 450 feet) and will be used to blend with and add its unique characteristics to the Pommard from the other blocks. The Dijon 777 clone has complex and well-defined aromas of strawberries, cassis, red currants, cinnamon, minerals and black raspberries. Wines produced from Dijon 777 are typically deep, rich and powerful in the mouth with a broad mid-palate that is focused by soft ripe tannins. The combination of clones	is expected to deliver a deep and elegant Estate Pinot Noir with spicy fruit, soft tannins, Pommard and 777 great structure. The lower 2 ½ acres of Block Four are being developed for Chardonnay Dijon clone varieties. The soil structure and vigor of this particular section, along with its orientation, should yield a nice, bright "classically French" yet uniquely Oregon Chardonnay with a crisp acidic appeal. with a hint of oak.